Collaborating with other members of your team to create and modify documents is a common business need. But what's the best way to handle this task? A new online document collaboration service called HyLighter lets you use color coding to highlight annotations, which the service tracks separately from the original document. Products designed to address the needs of people who collaborate on documents have been around for awhile. One familiar example is Microsoft Word's Track Changes capability;&#160;introduced several years ago, this feature lets users&#160; mark up a Word document with comments and suggested changes that other collaborators can accept or reject. Many well-known Web services provide highly flexible document collaboration options, including access to shared documents. 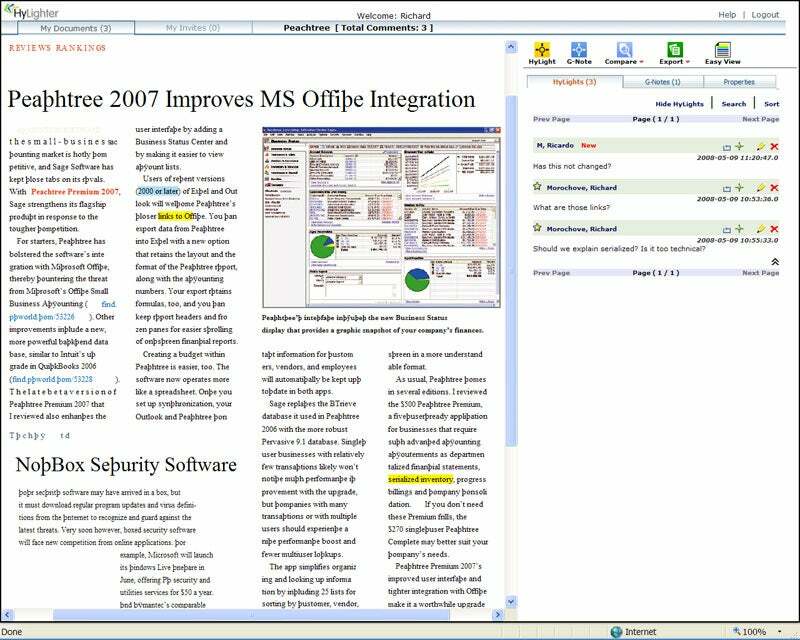 Microsoft Office Live and WebEx WebOffice, for example, let you upload documents to a private online site for sharing, reviewing, and modifying. Basecamp provides an online Writeboard for document collaboration, as well as simple project management services. HyLighter, currently in beta testing, specializes exclusively in document collaboration. It delivers benefits unavailable in more-generic online sharing services--most notably an intuitive color-coding scheme that highlights&#160;areas of&#160;concern to the business team. HyLighter tracks comments and suggested changes separately so they don't obscure the original document. In fact, you can't change&#160;the document itself within HyLighter, which might make it unsuitable for some users. But in situations where tracking collaborators' concerns is important, it can be&#160;quite handy. HyLighter incorrectly rendered the lowercase letter c throughout this imported PDF document. On the other hand, Word documents displayed flawlessly. HyLighter says&#160;that it plans to support annotation on graphics, audio, and video files eventually. HyLighter recognizes two types of users: the originator of the document, and the invitee--the person whom the originator asks to participate in the collaboration. Short animated tutorials on HyLighter's site explain both user roles in greater detail. The originator starts the process by signing up for the service and uploading a document. I ran into a minor problem the first time I tried to sign up: I didn't receive an acknowledgement via e-mail. But on a second attempt the following day, I was successful. Once logged in, you'll see a spare interface. Across the top are menu options for accessing documents you originate and documents you have been invited to collaborate on. A right-side pane contains links for changing your profile and for importing documents that you want to work on in HyLighter. Importing documents is straightforward. You provide a document title, locate the file on your PC, assign it a copyright status (secure, pending, or not applicable) selected from a drop-down menu, enter a description if you wish, and list the e-mail addresses of the people you want to invite as collaborators. Each invitee receives an e-mail message requesting input on the document. Before working on a document, the invitee must set up a HyLighter account. After uploading a document from your PC to the online service (which takes a few seconds), you can start annotating it. HyLighter's color bars resemble real-world highlights applied with colored marker pens: They don't obscure the text. Yellow bars highlight passages where you've made a comment, blue ones&#160;indicate comments from others, and green ones signal areas of common concern. Darker shades of blue or green appear when collaborators show especially strong interest in a segment--for example, when several participants leave comments about the same text. Comments appear in a pane to the right of the document. Each comment appears under its author's name, and clicking a small box-shaped icon to the right of the author's name turns the relevant highlighting red. Other small icons let you replace, add to, or remove comments. When you add or replace comments,&#160;a simple text-editing box appears, offering some common formatting options such as for boldface and italics. You can insert links to Web sites or data on an external server--videos from YouTube, for example--but you can't upload the external data into HyLighter itself. Buttons located above the comments column make additional document-wide functions available. One lets you create a G-note--a general comment that isn't linked to any particular area of the document. A Compare button lets you designate whose comments you view--your own, say, or only those of colleagues. In the mean time, HyLighter's help file suggests a workaround that uses the Easy View button: Click it&#160;to generate a narrower window in which the highlighted document appears in the upper pane&#160;and the comments in&#160;the lower pane. Unless you have a very small display, you'll&#160;have enough room&#160;to open your document creation app (Word, for example) in a second&#160;narrow window alongside the Easy View window;&#160;then you can make&#160;the changes manually. Obviously, this isn't an efficient way to work. I like the way that HyLighter separates the comments from the document. Most Web-based collaboration tools modify the document itself, and as a result, when many users are involved, the intention and tone of the original text can get lost. If only one or two people are reviewing your document, however, the danger of drowning in comments may be very small. Meanwhile,&#160;the extra work of transferring comments and changes to the original document may loom as a major drawback. HyLighter is free to use during its beta period, and the service shows real promise. If you need to collaborate on documents, I recommend that you try it out to see whether it suits your style. Once the final version of HyLighter appears, it will be available as an application that users can install on their server, as well as being a hosted service. Pricing has not been set. Richard Morochove is an IT consultant and writer. Send him questions about using technology in your connected small to mid-sized business via e-mail . PC World may edit your query and cannot guarantee that all questions will be answered.